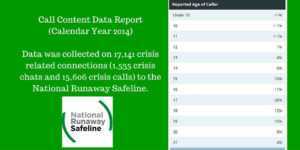 Teenage runaway statistics are valuable because they reveal the demand for our services. However, that only tells one side of the story. 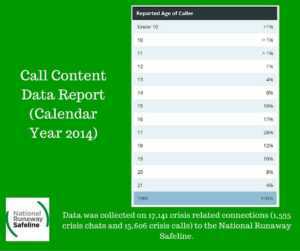 The numbers and percentages also demonstrate the danger that runaway youth face, the level of abuse that they suffer, and the various reasons that they choose to contact NRS. These ignite our imagination enough to show us how important an issue America is facing and that we all play a part is repairing it. 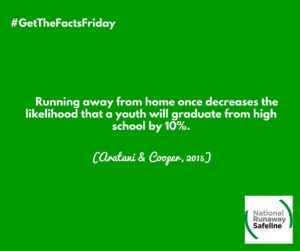 Below are some of the runaway statistics that we have shared in the past. You can find more on our crisis hotline and online services, broken down by state. 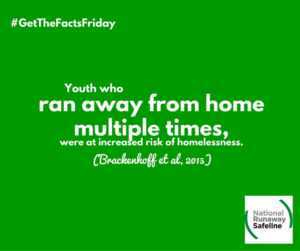 You can also find research on homeless teens and runaway youth. You can also study third party statistics on related issues such human trafficking and LGBTQ. Feel free to download these images and share them on your network, so they can better understand the importance of our work and how they can help, either by volunteering or donating. Help us to continue our mission to keep runaway youth safe and off the street.